Sell the same number of higher strike calls with a shorter expiration date. If the stock closes above the higher strike at expiration, you will be exercised. You will sell your long call, buy the stock at the market price, deliver it at the higher strike price, whilst having profited from both the option premium you received and the uplift in the long option premium. Exercise of the short option is automatic. Do not exercise the long option or you will forfeit its time value. If the stock remains below the higher strike but above your stop loss, let the short call expire worthless and keep the entire premium. If you like you can then write another call for the following month. If the stock falls below your stop loss, then either sell the long option (if you're approved for naked call writing), or reverse the entire position. With Diagonal Call spreads, your outlook is bullish. To generate income against your longer term long position by selling calls and receiving the premium. This is a net debit trade because your bought calls will be more expensive than your sold calls which are OTM and also have less time value. Your maximum risk on the trade itself is limited to the net debit of the bought calls less the sold calls. Your maximum reward on the trade occurs when the stock price is at the sold call strike price at the expiration of the sold call. Time decay affects your Diagonal Call trade in a mixed fashion. It erodes the value of the long call but helps you with your income strategy by eroding the value faster on the short call. You will be safer to choose a long time to expiration with the long call and a short time (1 month) for the short call. Lower strike: look for either the ATM or ITM (ideally about 10-20% ITM preferred) strike below the current stock price. If you're bullish, then choose a lower strike, if neutral choose the ATM strike in anticipation of writing more calls in the future. Higher strike: look for OTM by more than 1 strike to enable the long call to rise in value if you get exercised on the short call. Look for over 6 months for the long option. Depends on the value of the long call option at the time of the short call expiration. Time Decay is at its most helpful around the higher strike price. Delta (speed) is at its fastest either side of the higher strike price. The blue line represents the position today (approx 1 month away from the short call's expiration) and the magenta line represents the position where the short option has only 5 days to expiration. 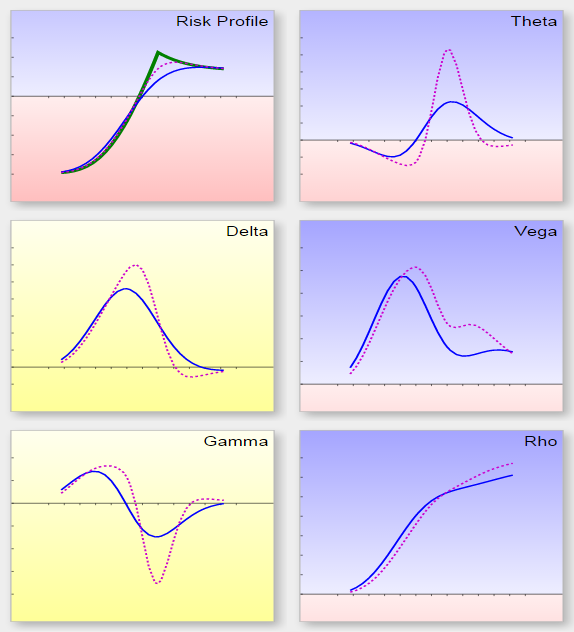 Gamma (acceleration) peaks inversely around the higher strike price. Higher interest rates become more helpful to the position as the underlying asset price rises. With this strategy you can simply unravel the spread by buying back the calls you sold and selling the calls you bought in the first place. Advanced traders may leg up and down as the underlying asset fluctuates up and down. In this way the trader will be taking smaller incremental profits before the expiration of the trade. Lesson: Never exercise a long term option because you'll miss out on Time Value!